If you install cable, you've probably heard a lot about cable testing and how important it is. Did you know there are three types of testing? Verification, qualification and certification are all essential, but each type of testing answers different questions about your cable. Let's take a look at how these three types of testing can help you answer important questions. Verification testing answers this question. For copper cabling, these simple-to-use, low cost tools perform basic continuity functions, such as wire map and toning. Wire mapping will tell you if each pair is connected to the right pins at plugs and jacks with good contacts in the terminations, while toning is used to help identify a specific cable in a bundle or at the remote end. Some verification testers, like Fluke Networks' MicroScanner2 Cable Verifier, include a Time Domain Reflectometer (TDR) feature to help determine the distance to the end of a cable or a trouble spot. It can also detect if a switch is connected to the cable under test. Qualification testers include verification functionality, but they are more sophisticated with their ability to qualify cabling bandwidth. Qualification provides the information needed to determine if the cabling under test will support the signaling of specific applications. For example, if you have two cables that pass verification testing, Fluke Networks' CableIQ™ Qualification Tester might also show that only one of the cables can support 10BASE-T (i.e. 10 Mbps Ethernet) while the other can support 1000BASE-T (gigabit Ethernet). Combined with verification functionality, qualification testers are also excellent troubleshooting tools. They are ideal for small adds, moves and changes, or for setting up a temporary network that needs to be qualified for a specific network technology. They can also help in deciding whether an existing cabling plant needs to be upgraded to support a new application. While the decision to use verification, qualification or certification testing ultimately comes down to what your customer requires, the bottom line is this: if you want the support and financial security offered by a cable manufacturer warranty, certification to industry standards with a tester like the DSX CableAnalyzer™ is your only option. 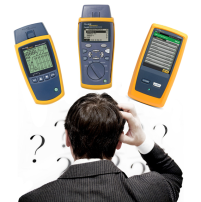 Click here to learn more about Fluke Networks.